The Indigenous Faith & Cultural Society of Arunachal Pradesh (IFCSAP) today demanded the Arunachal Christian Forum (ACF) to withdraw its demand for rolling back the proposal for creation of the department of Indigenous Faith & Cultural Affairs (DIFCA). Earlier, the ACF had demanded rolling back the DIFCA while citing Article 27 of the Indian Constitution which says about the utilization of public taxed money for promotion of particular religion. 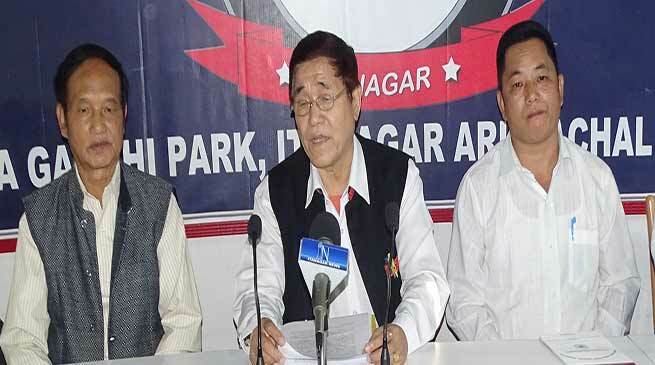 IFCSAP president Dr Ligu Tacho today in a press conference at Arunachal Press Club here refuted the demand of ACF while stating that the indigenous faith of the tribal population in the state is not a religion but a faith which is does not comes under the purview of Article 27 of the Indian Constitution. Adding that the ACF should not have any problem with indigenous people working towards preservation and protection of its faith and culture and tradition he asked the ACF to come out with its main bone of contention in creating the department. He added that opposing for the creation of DIFCA by ACF may be tantamount to opposing the indigenous practices of the tribal people of the state which may be construe as refusal of their ST status and IFCSAP shall compel to take up the matter legally in due course of time. Further, stating the creation of a separate department for preservation and protection of indigenous faith and culture, tradition, language has been a long standing demand of the IFCSAP since 1999, the IFCSAP said that thus allegation of dictation and influence of RSS or any political party for its creation is completely baseless and unfounded. Secretary General Bai Taba however said that it is felt to understand inspite of appreciating the state government for creating the department which shall work for preservation of faith and culture and tradition and identity they are opposing it which is meaning less and they should think twice, creation of this department done not mean that it would work against other caste, tribe and religion but it would work for the welfare of indigenous people of state.